Special Discount Price: $5.00. Print only. A compelling and candid biography of Minnesota’s most beloved state representative. From Willard Munger’s impoverished birth in a northwestern Minnesota log cabin to his legendary train trip to the nation’s capitol to lobby FDR during the Great Depression to his ill-fated run for the Minnesota House of Representatives as a twenty-three-year-old Farmer-Laborite in 1934, the first section of this hauntingly detailed look at Munger’s life, “Pockerbrush Boy,” expands the reader’s understanding of the origins of the Liberal movement in Minnesota during the early twentieth century. The second section of the book, “Entrepreneur,” chronicles Munger’s migration to the inland seaport of Duluth, Minnesota, his work as a union laborer in the factories and the shipyards of the Twin Ports, the beginnings of his business enterprises in the blue collar neighborhoods of West Duluth, and his involvement with the fledgling Democratic-Farmer-Labor Party of Minnesota as both organizer and candidate. (A) primer on grassroots politics for any political aspirant…(and), for the rest of us, a story of “how to die with your boots on”…This anecdotal biography is written with humor and packed with personal stories that run the gamut of emotions. Budgeteer News. 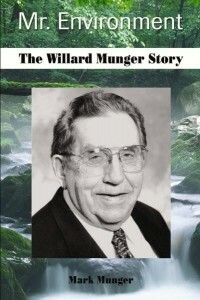 Just wanted you to know that I had finished your book on Willard Munger…I enjoyed it very much, particularly the old politics…I also learned a great deal about Willard’s stand on environmental issues, and it was important you documented that information and the history of how some of these laws came into effect. Congratulations! Thank you so much for this biography of Willary Munger. The sections on his early political involvement and particularly his later legislative career were fascinating. What an incredible (and incredibly important) legacy Willard left behind him, for which all Minnesotans should be grateful. Thank you for documenting it, as I fear we’ve forgotten or neglected much of it already. I’m only about 150 pages into this book but I’m loving it! I knew so little about the early days of the Farmer-Labor party, but it’s a fascinating evolution. Sadly, I know how it turned out, but I’m loving the story. Willard Munger’s legacy is a marvelous thing for all Minnesotans. We need to learn and remember. Back to reading, and thanks! Thanks, Cyn. That book, more than any of my others, was a labor of love. I am happy you appreciate my effort and Willard’s tremendously overlooked legacy. When you are done, consider posting a review on Goodreads (www.goodreads.com) or Amazon if you liked the book. Again, thanks for the feedback.